Here at Tipstrr we enjoy a bet (not very surprising), and over the past few months, we upped the ante. We deposited with a well known brokerage called Eastbridge, who provided us with Asian prices, as well as using Matchbook and Bet365. During the first three months of 2015, we placed a lot of bets (around 1,500 in total). In three months, we had staked a good 6 figures across the three accounts we were using. Everything went according to plan, we placed bets at whichever of the three accounts offered the best price, and it was split pretty evenly - with Bet365 getting some bets because Matchbook and Eastbridge didn't offer 100% of what we were betting on (some lower league and other sports). At the end of the three months we decided to withdraw all of our funds. Eastbridge were excellent, processing our withdrawal instantly and the funds were in our account within 24 hours. Matchbook were similar (although it was fractionally slower). Bet365 was a different story and is where the issues began. Initially we withdrew our entire Bet365 balance, with no problems (just over £5,000). Then on the final day of our betting experiment we deposited another £360 in anticipation of placing a few more bets. We decided against using our Bet365 account, so the next day we withdrew this £360, but 2 weeks later and it still hadn't arrived. We weren't given any info from Bet365, so we had to approach them ourselves to try and find out where our money was. In short, they told us that they had held the money because they needed confirmation of ID. Passport and proof of address was promptly sent in via email, but they still weren't happy, and said that it wasn't enough. Perplexed, we asked why they would hold £360 after we had bet so much (in excess of £25,000) over the previous few months. They didn't really give an answer, but insisted they needed a code they had sent - to an OLD address. After making it clear it wasn't possible to obtain this code (sent to an address 180 miles from where we are now located), they said that there is no alternative and that it will have to stay with them. 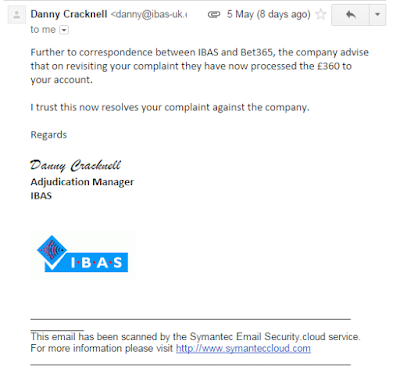 So, Bet365 gave us the money back once they realised we had complained, and have since closed the bet365 betting account, which unfortunately means we cant get any screenshots of the activity to further explain the story. However, the aim of this blog was to show that if you are treated unfairly by any bookmaker - raise a dispute with IBAS, who will investigate further and (based on what we've read) will work promptly and endeavour to help the customer.